A very special phenomenon is taking place tonight: a second full moon in the same month, also known as "Blue Moon"! The first was on July 2 and under certain circumstances it is indeed characterized by a bluish color, instead of the standard gray. This happens after a large volcanic eruption, when the atmosphere is highly concentrated in dust, as it happened for example at the explosion of the volcano Krakatoa in 1883. This phenomenon is so rare there is even a relevant expression “once in a blue moon” that means hardly ever. The "Blue Moon" although unusual, since the period from one full moon to the next reaches about 29.5 days, it is not in fact rare since it occurs on average once every 2.7 years. 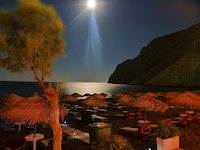 Do not miss the unique opportunity tonight to experience this phenomenon in Santorini! Get ready shortly after 8pm, facing the east or somewhere high in altitude such as the Monastery of Prophet Elias, or at sea level in one of the numerous eastern beaches such as Kamari and enjoy the wonderful reflection of the moon light on the calm sea ... just magic!